With my first set of German infantry and MG 42 machine gun complete, I’ve doubled my 28mm Axis force with more models from Artizan Designs. 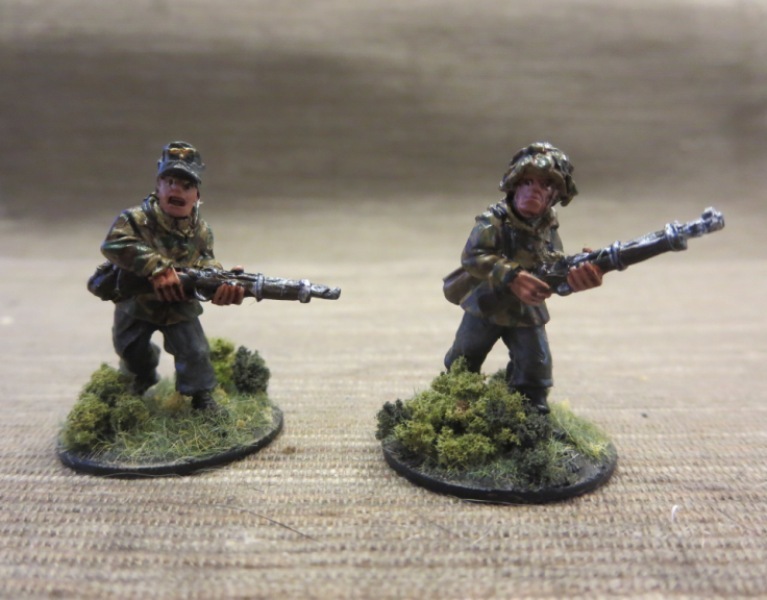 In just a few words, I’m loving the models from AD and my only complaint is that I’m quickly working my way through their figures so I’ll soon have a complete selection of their basic late war Germans. 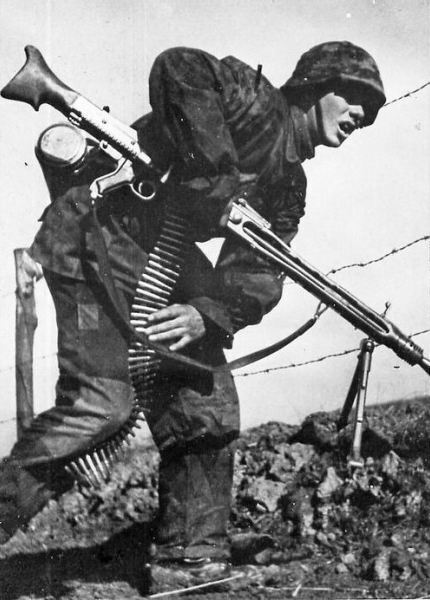 This time around, there are a number of animated infantry figures in a mix of helmets and soft caps plus another MG 42 machine gun to supplement my arsenal. 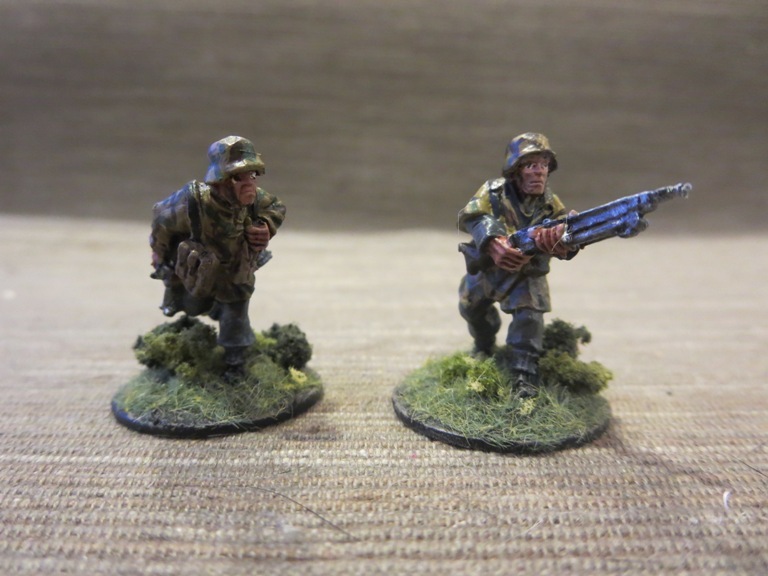 My German paint scheme has remained consistently fast and satisfying as per the below. Clean flash from metal models with a sharp knife and glue to metal washer or plastic bases. Apply filler putty to bases. When dry, scrape off excess with a sharp knife. Basecoat models and bases with flat black spray primer. Paint smocks and helmets with Tallarn Sand. 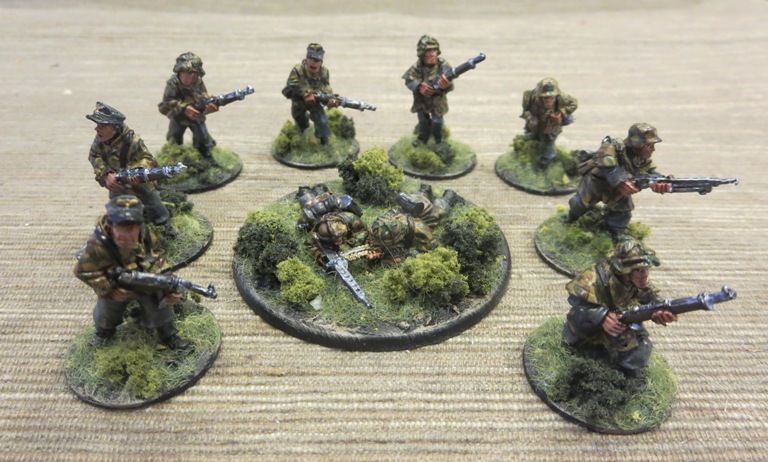 Paint pants, soft hats, officer greatcoat and gas mask containers with Skavenlight Dinge. Paint camouflage on helmets and smocks with alternating Waaagh! Flesh and Dark Brown. Paint faces and hands with Tallarn Flesh. Paint packs with Baneblade Brown. Paint boots and equipment straps Black. Paint bases, gun stocks, water bottles and helmet straps with Dark Brown. 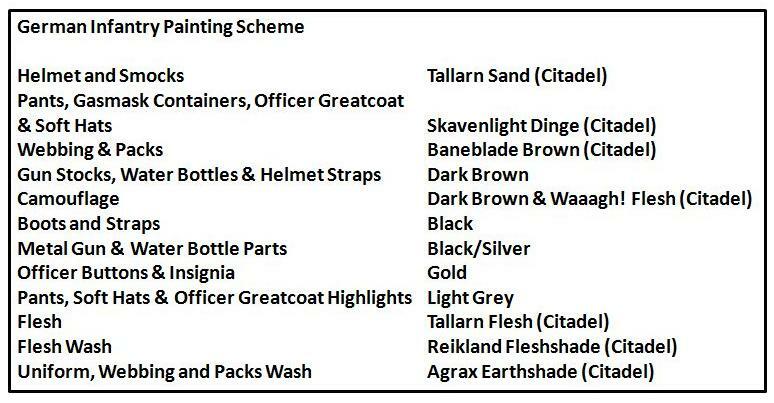 Apply Agrax Earthshade wash to uniforms, helmet netting, webbing and packs. Mix 50/50 Baneblade Brown and Off White and lightly dry brush packs, webbing, socks and holsters. Dry brush pants, soft hats and officer great coat with Light Grey. Lightly dry brush bases and gun stocks with Baneblade Brown. Paint metal gun and water bottle parts with black and finish with a light dry brush of Metallic Silver. Dry brush gasmask containers with metallic Silver. Paint eyes with small dots of Off White and Dark Brown. Clean up around eyes with Tallarn Flesh. Mix 50/50 Tallarn Flesh and Off White and brush highlights on cheekbones, chins, forehead, nose and hands. 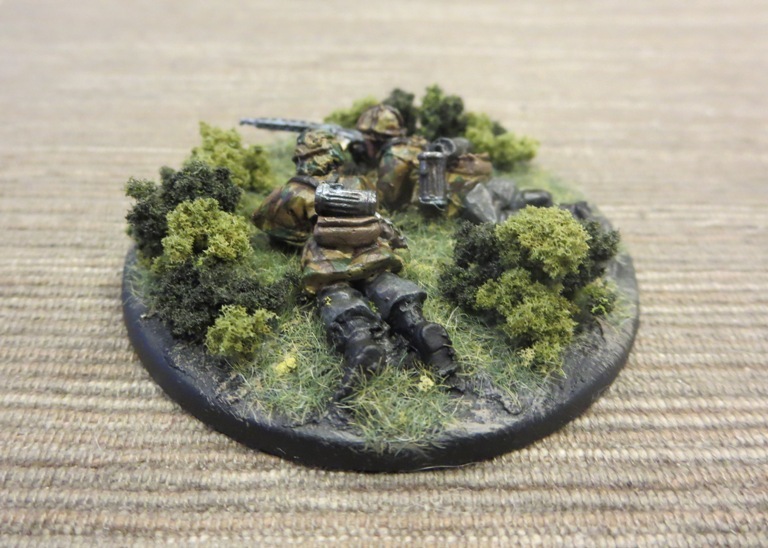 Cover bases in white glue and cover in 50/50 mix of fine light green and dark green grass flock. Glue small pieces of clump foliage to base. Spray coat completed models with matte finish. And now, more photos of my Germans as my force builds up and looks toward hitting the table soon.